Page 3 – Use the diagram called “There are Three Types of Thinkers” to help students understand the importance of critical thinking. Ask them to imagine a world filled with only naive thinkers. What would life be like for everyone? What if everyone were a selfish critical thinker? Why would a world of fairminded critical thinkers be better? Pages 8-9 – Use the descriptions of intellectual traits, such as intellectual courage and intellectual humility, to help students identify strengths and areas for improvement. Ask students to write a journal entry explaining which trait is their greatest asset and which one they plan to work on. Pages 16-17 – Ask students to use the intellectual standards to evaluate each other’s presentations, essays, or contributions to a class discussion. Or, use these pages to assign roles within a group. As the group discusses an important question or solves a problem, each student must ensure that the conversation or solution meets the intellectual standards he or she has been assigned. Page 19 – Ask students to fill out this journal entry every Friday as a reflection on the week. Works great in a short advisory/homeroom period or as the start of a check-in about classroom culture. Page 20 – Use the logic wheel to direct work during a research project. Ask students to choose a topic or question, set their own purpose, determine what type of information they’ll need, etc. As you check in with each student, ask some of the questions on pages 21 – 28. Pages 34-41 – Use these subject-specific templates to help students analyze key experiments, problems, characters in a story or chapters in a textbook. 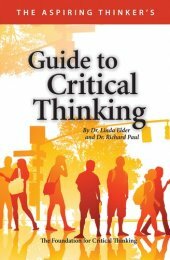 Page 47 – Here is your daily critical thinking exit slip!